Schools in the Kansas City metro will soon be releasing for summer break but new freedom can be dangerous. Teens drink more heavily in the summer than during the school year for a variety of reasons. Many teens are able to relax their brains during the summer, but idle time often gets kids into trouble. Approximately 11,000 teens use alcohol for the first time during the summer. 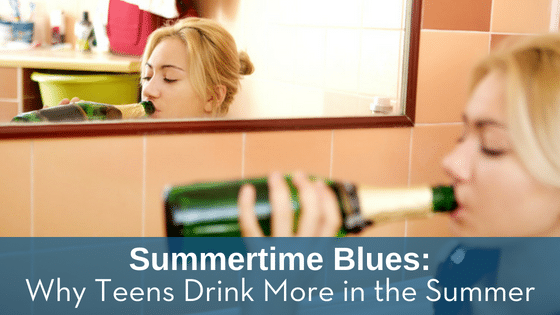 A summer job or internship can keep teens busy all summer and away from alcohol. School guidelines provide some structure during the fall, winter, and spring, but summer means less pressure and fewer responsibilities. Teens who are home all summer without adult supervision are more likely to abuse alcohol simply because there’s no one to stop them. Summer is a teen’s time to hang out with friends they might not see as often during the school year. However, this can open up relationships that might not be healthy for your teen. A friend’s drinking might make it easier for a teen to pick up the habit, no matter the age. Studies show that teens who started drinking at a younger age tended to abuse alcohol more than teens who waited. You might think that a break from school also means a break from the school drama, but teens are constantly undergoing mental, physical, and emotional changes that can be frustrating and scary. Teens may experiment with alcohol because they’re stressed, scared, curious, desperate, or for fun. Their impulse control may not be strong enough to say no. Parents can best help their teen with substance abuse by setting boundaries and talking openly about expectations. An outwardly negative attack may drive your teen to hide their behavior, but firm rules may help guide your teenager to make the right choices. Encourage open and honest communication between you and your teen. Conversations about alcohol abuse can be difficult, but they can also stop your teen from developing a deadly habit. If you suspect your teen is experimenting with alcohol this summer, we provide accurate and confidential alcohol testing. Please contact Test Smartly Labs today. Previous ArticleDo You Know What Your Kid is Vaping?